In his letter, James is giving some final instructions in chapter fifteen; honor God’s name, pray at all times, and confess sins. James closes encouraging us to rescue sinners from their bad ways. The quoted verse exhorts the community and us to confess our sins to one another. Seeking forgiveness brings cleansing from sin and peace with God. Confessing to one another is not completely defined. Jesus taught we should be reconciled with one another before bringing our gift to the altar. 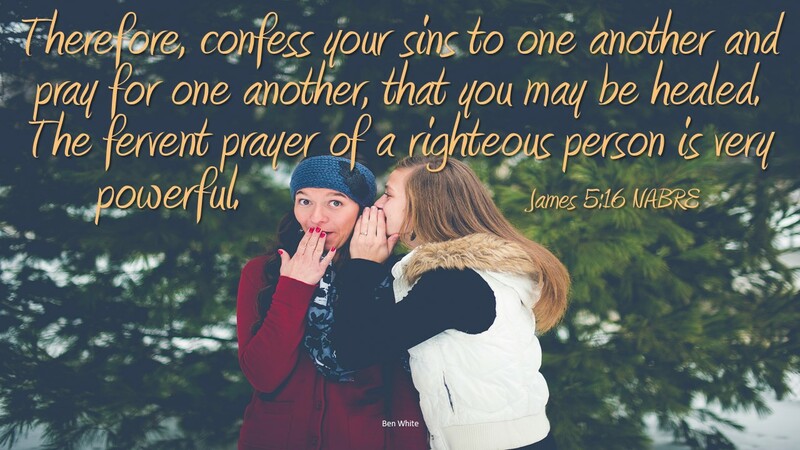 It is an insider message, confess your sin to another member of the community, someone who understands forgiveness and Jesus’ desire for reconciliation. James goes on to say that the prayer of a righteous person is very powerful. Being righteous means being in right relationship with God, ready for life. So the implication is we should confess our sin to someone righteous, someone in our community, someone who will receive us lovingly and attentively. When we confess our sins we are forgiven and the prayer of our confessor goes powerfully to God who will bring us peace. Sin is a state of separation. When we are in sin we are turning ourselves away from God and those of our community. Sin effects all who are in the community, it makes a break that causes pain for all. We are all impacted by one sin. Confessing our sin makes healing for ourselves, it closes out the separation from God and our brothers and sisters in the community. So confessing is healing as surely as medicine for the flu. Confessing creates harmony and joy in the community, it brings everyone closer to God and each other. Do you confess to another? Have you attained peace from confessing?